Did you hear the one about the roast beef that was forgotten in the fridge? Well you almost did. Because I almost forgot a rather large beef roast that I purchased easily 6 days ago. Thank goodness my refrigerator is cold. Actually the “aged for flavour” time may have done it some good. This was one of the best roast beasts I ever did. Apologies to Dr. Seuss. I had to deal with it, and all at once. No portioning it out for cooking later. If I waited I do believe the beats would have come alive in the refrigerator, or something anyway. 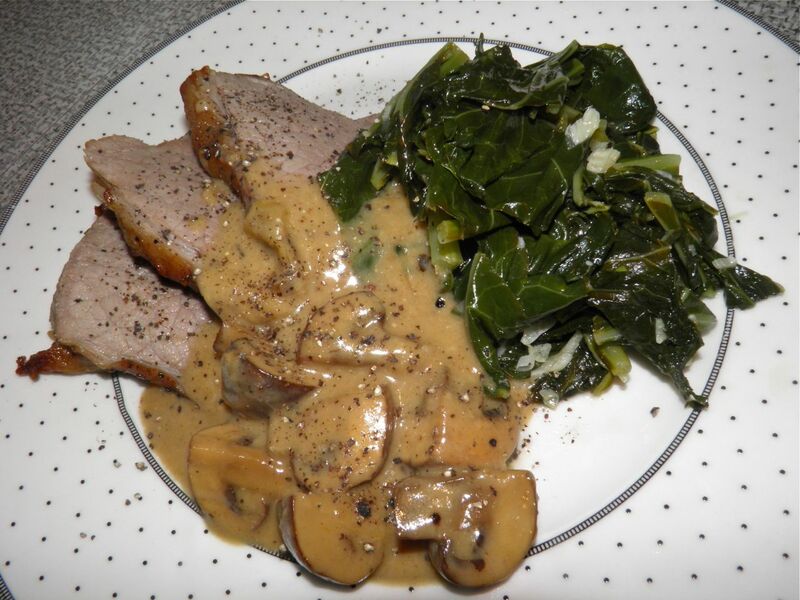 When you have big meat, do big recipes I say, among other things. The biggest? Roast, or in this case braised roast. I have this thing where I can never leave well enough alone. I thought that a little red wine wouldn’t hurt. It never does any other time. But fate intervened. 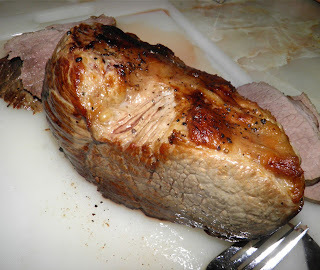 Covering the roast allows the flavour of the sherry to permeate the meat – so don’t use garbage sherry. Spend a little dough. Just a little. Of course one shouldn’t venture into the unknown without some sort of plan or strategy. Mine included mushrooms and horseradish. One cannot have roast beef without some sort of sauce, right? This roast turned out to be one of the simplest I have ever done, besides one of the best. The only seasoning that went in was horseradish, salt and pepper. Once you try this you’ll understand why nothing else is necessary. Making a roast does take some time, in this case 1hr 45. But it’s well worth it. And the oven does pretty much all of the work. So the next time you almost forget an entire roast in your refrigerator, try not to forget this recipe. You’ll get rave reviews at the table. Heat the oil in a Dutch oven or other ovenproof pot with a lid. Season the roast with salt and lots of pepper. Sear the roast on all sides until well browned. Pour the sherry into the pot. Then scatter the onions, garlic and mushrooms around the roast. Cover and bake for 1 hour. Then uncover and bake for an additional 1/2 hour or until a thermometer inserted in the centre reads 165°F. Remove the roast and let rest. 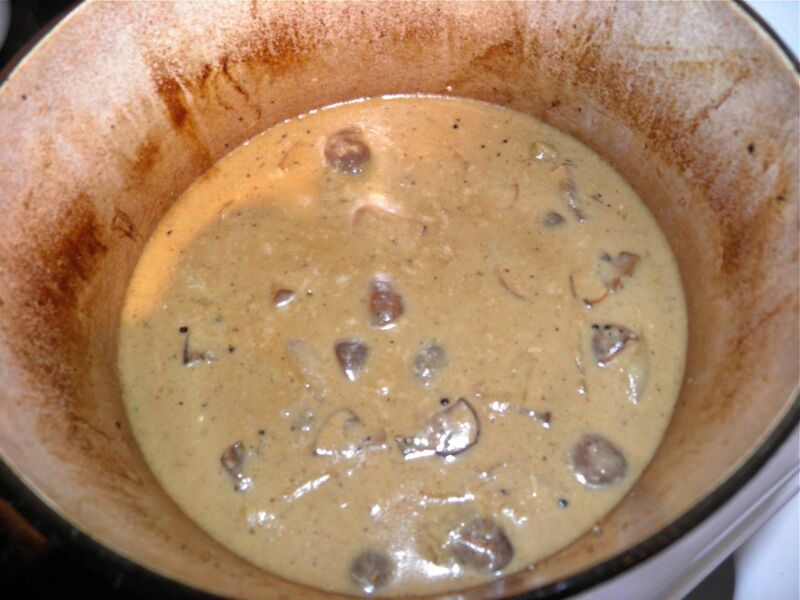 Stir the horseradish and sour cream into the braising liquid and mushrooms. Season with salt and lots of pepper. Pour the cornstarch and water into the liquid and bring just to a simmer. Stir until thickened. Do not let the mixture boil or the sour cream may curdle. Serve slices of the beef with the sauce. 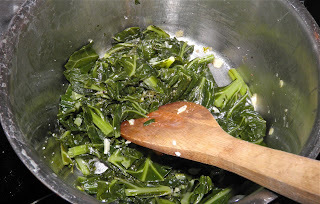 Remove the stems from the greens. Chop the leaves into 1” pieces. Boil in salted water for 12 minutes and then drain. Heat the oil in a pot. Sauté the garlic until fragrant. garlic. 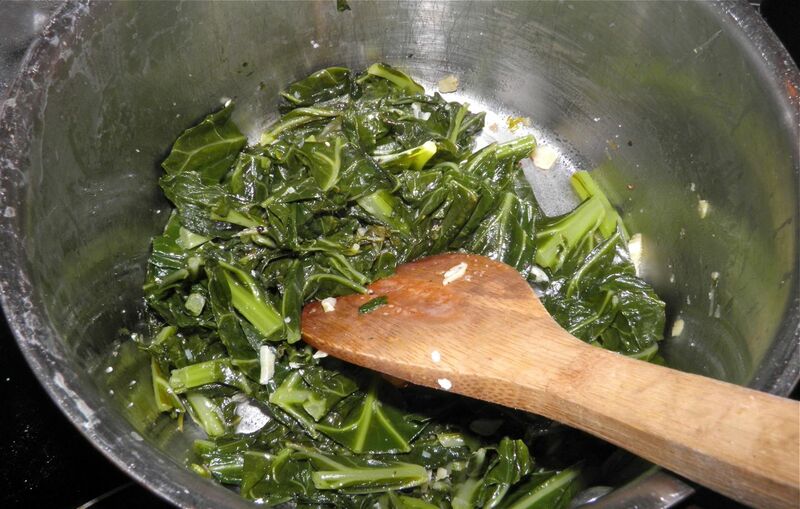 Add the cooked collards. Season with salt and pepper and sauté for 5 minutes. Just before the time has finished, drizzle with lemon juice. Serve more lemon at the table if desired.